The PowerShot SX240 HS is undoubtedly a much better camera than the SX230 HS that it replaces. People buy pocket super-zooms primarily for the extreme zoom range they offer and Canon has extended the 14x zoom of its predecessor to 20x taking it from the back of the pack to a position equal to the market leading ZS20 / TZ30 and Sony's latest rival. Canon has also addressed the other major shortcoming of its entire compact range - poor continuous shooting performance. It'll be interesting to see if this feature is rolled out in other Canon 2012 premium compacts. The Canon PowerShot SX240 HS and SX260 HS are Canon’s 2012 pocket super-zoom replacements for the PowerShot SX230 HS. The headline feature with pocket super-zooms is obviously the optical range and Canon has extended the reach of the PowerShot SX240 HS and SX260 HS to 20x with a new lens that’s equivalent to 25-500mm. That puts them on a equal footing with Panasonic’s market leading Lumix ZS20 / TZ30 and Sony’s HX20V / HX30V. Canon has resisted the opportunity to increase the resolution and has stuck with a 12.1 Megapixel back-illuminated CMOS sensor, but the image processor has been upgraded to the Digic 5. The best quality movie mode remains 1080p24, and the 3 inch LCD screen has the same diagonal size, but its aspect ratio has changed from 16:9 to 4:3, and the image stabilisation has been updated to Canon’s new Intelligent IS system. So far the SX240 HS and SX260 HS are identical, so what’s the difference between the two models? It boils down to a single feature: the SX260 HS has a built-in GPS receiver whereas the SX240 HS does not. In regions which offer both models, this gives you the choice whether to go for GPS or not, but in other regions only one model may be available. For example in North America, only the GPS-equipped SX260 HS is on sale. Either way, in every other respect the SX240 HS and SX260 HS are identical, so all tests and results are applicable to both models. I got hold of the SX240 HS for review, so from this point on I’ll refer to both models as the SX240 HS unless I’m explicitly talking about the GPS functions of the SX260 HS. 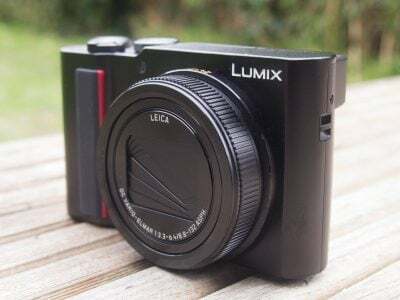 Having pretty much invented and then dominated the pocket super-zoom market, Panasonic’s Latest Lumix models look set to continue the trend, but could the PowerShot SX240 HS be the first model from Canon to really challenge Panasonic’s lead? To find out I’ve compared the PowerShot SX240 HS with both the 20x 14 Megapixel Lumix ZS20 / TZ30 and the slightly more affordable 16x 12 Megapixel Lumix ZS15 / TZ25. The PowerShot SX240 HS is almost the exact same dimensions as the Powershot SX230 HS it replaces. At 254g including card and battery it’s a little heavier, no doubt due to the longer lens, but a little extra weight is a small price to pay for the extra reach and it’s a credit to the Canon designers that the SX240 HS is as compact as its predecessor. 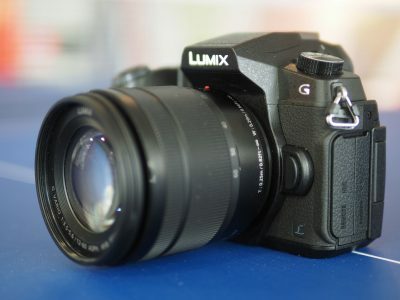 Compared with the Lumix ZS20 / TZ30 the SX240 HS is a little bigger all round as well as a little heavier; its also a little curvier than the squareish Lumix models. Both rivals are on the large side of the compact spectrum but will fit comfortably in a jacket pocket. The SX240 HS’s curves are more shapely than those of its predecessor which had a kind of raised belt around its perimeter. It’s an elegant design which is also practical: it’s comfortable to hold in the hand thanks to a vertical finger grip on the front panel. The top panel has a dished profile which also helps with handling and the lozenge shaped on/off button sits just to the right of the large shutter release with its zoom collar surround. The rear controls are identical to those on the PowerShot SX230 HS, with a mode dial, four-way controller, and buttons for direct movie recording, playback, display overlays and the menu system. The back panel lacks the SX230 HS’s curvy contours and is a plainer, simpler design. The SX240 HS has a 3 inch 461 thousand pixel screen which differs in one very important respect from its predecessor. The proportions of this screen are 4:3 not 16:9. While many manufacturers can’t seem to make up their minds about screen proportions on compact cameras that can shoot 4:3 still as well as 16:9 HD video, it seems that, at least as far as the SX240 HS is concerned, Canon has decided to provide a screen best suited to shooting stills, rather than video – a decision I’m personally very pleased about as will be anyone who intends to use the SX240 HS primarily as a stills camera. The other factor in this may be that the screens on both the Lumix ZS20 / TZ30 and the Sony Cyber-shot HX20V / 30V are 4:3, though the former is a touch-screen and the latter a higher resolution panel with 921k pixels. The 4:3 screen proportions mean that the image fills the full screen area with info overlayed on top. Of course, if you switch to movie mode the image is letterboxed with black bars top and bottom. The screen itself is clear, bright and punchy with no hint of pixellation at normal viewing distances. It has good visibility across a wide range of viewing angles horizontally and vertically, so you can see pretty well even with the camera held at arms length above your head. Like all screens, it’s a chore to use in bright sunlight and all you can do is try and create a bit of shade with your hand. The flash on the SX240 HS is a pop-up unit similar to those on earlier versions. Mercifully though, Canon has finally programmed the mechanism to function more sensibly and it no longer pops up when you turn the camera on regardless of the flash mode. It now behaves exactly as you’d expect – automatically raising itself when required and retracting when no longer needed. In PASM modes the flash has ‘Auto,’ forced on, forced off and slow synchro modes, and has a quoted maximum distance of 3.5 metres. Smart flash automatically adjusts power depending on the proximity and brightness of the subject and recycles in around two to four seconds, and you can also manually set flash exposure compensation up to plus or minus 2 stops in 1/3 of a stop increments. You can also attach the HF-DC2 accessory flash which is triggered by the built-in unit and extends the range to around nine metres. A flexible plastic cover on the right side of the body protects the USB 2.0 and mini HDMI ports, while the door for the combined battery and card compartment is on the bottom right. 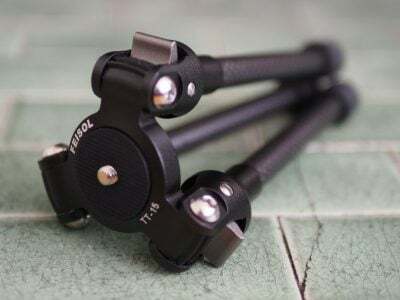 It’s hinged around the off-centre tripod bush, a slightly unusual design which prevents changing card or battery while tripod mounted. The SX240 HS takes a Canon NB-6L battery which provides enough power for 230 shots – a slight improvement on the 210 of its predecessor but not quite in the same league as the Lumix SZ20/TZ30 with 260 shots per charge. It’s compatible with SD, SDHC and SDXC cards. The SX240 HS has a new 4.5-90mm 20x optically stabilised zoom lens which has a 35mm equivalent range of 25-500mm. The previous two generations of PowerShot SX pocket super-zooms have shared the same 14x optics, so it’s no surprise to see Canon introduce a new lens putting it on a par with competing models like the Lumix ZS20 / TZ30 and the Sony Cyber-shot HX20V / HX30V. The SX240 HS’s zoom has been extended at both ends of the range; the wide angle is broadened from 28 to 25mm and at the long end it now reaches a 500mm maximum telephoto compared to 24-480mm on the Lumix ZS20 / TZ30; note the Sony HX20V / HX30V shares the same 25-500mm range as the Canon. Beyond their equivalent ranges, there are a couple of other differences in their optical specifications worth noting. The maximum aperture of the SX240 HS is f3.5-6.8 making it fractionally darker than both the Lumix ZS20 / TZ30 at f3.3-6.4 and the HX20V / HX30V at f3.2-5.8. It’s an extraordinary zoom range which allows you to go from super wide angle to long telephoto in a matter of a few seconds using the two-speed zoom rocker. There’s very little in terms of subject matter that you won’t be able to tackle, bar extremely distant small subjects. About the only drawback, and it’s a small price to pay, is the relatively modest 5cm closest focussing distance. Clearly on a camera with a 500mm telephoto, image stabilisation is an important feature. The SX240HS has Canon’s Intelligent IS optical image stabilisation which analyses the scene and sets the appropriate stabiliser mode. There are three settings in the menu – continuous, shoot only and off. 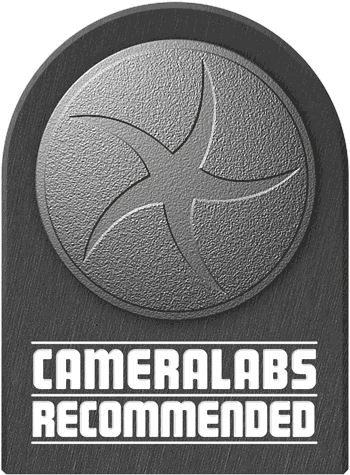 The camera automatically chooses one of seven stabiliser modes including the horizontal and vertical panning modes that you previously had to select manually. It also has a mode especially for macro shooting and can additionally tell when the camera is on a tripod and turns stabilisation off. I tested the PowerShot SX240 HS’s image stabilisation by zooming the lens to it’s full 500mm telephoto range and taking a sequence of shots in Shutter priority mode at progressively slower shutter speeds both with stabilisation off and in continuous mode. As you can see from the 100 percent crops below, the PowerShot SX240 HS is capable of eliminating camera shake down to 1/30th with IS on, that’s four stops slower than conventional wisdom suggests. 100% crop, 4.5-90mm at 90mm, 100 ISO 1/30th, IS off. 100% crop, 4.5-90mm at 90mm, 100 ISO 1/30th, IS on. The SX240 HS has PASM exposure modes selectable from the mode dial as well as the full complement of Canon’s auto exposure modes. SmartAuto uses Scene detection to correctly determine the exposure in a wide range of shooting conditions by analysing both the subject and lighting conditions. The Digic 5 processor expands on the number of scenes which could be recognised by the earlier Digic 4 in the SX230 HS and can recognise sleeping and smiling babies and running children in addition to other subjects under a range of lighting conditions from sunsets to night time. The Easy position on the mode dial sets Smart auto mode and disables all the buttons bar flash (off or auto) and there’s also a discrete mode that mutes all sounds and disables the flash and AF illuminator. In between the manual and point-and-shoot auto modes, the PowerShot SX240 HS has an excellent range of fun and creative shooting to choose from. These include Creative filters for effects such as Fisheye, Miniature, Toy camera, Soft Focus, Monochrome, Super vivid, Poster, Colour accent and Colour Swap. Then there’s a selection of scene modes including the Handheld NightScene mode which stacks three exposures (fewer than the equivalent feature on Sony and Panasonic models) to produce a lower-noise composite. If you want to play around with exposure and colour settings without getting too technical, the Live control position provides sliders for exposure compensation (Dark/Light), saturation (Neutral/Vivid) and white balance (Cool/Warm). Finally there’s Movie Digest mode which is a feature unique to Canon compacts. This shoots a short 2-4 second clip before each still shot, then stitches them all together. It’s a great way to compile a movie of a special event like a wedding or birthday and takes almost no effort. The only drawback is that the camera is effectively recording and buffering video the whole time it’s switched on in this mode, so the battery life is shortened. The SX240 HS has the Smart Shutter feature which uses Face detect to take shots automatically. It has three options – Smile, Wink self-timer and Face self-timer, each of which can be configured to take between one and ten shots. The SX240 HS lacks any kind of 3D mode and while there is a stitch assist option that helps you shoot overlapping frames there’s no in-camera panorama feature like on the Lumix ZS20 / TZ30 and the Sony HX20V / HX30V; Canon is looking a little dated in this regard when its rivals are capturing and stitching panoramas with a single sweep of the camera. The SX240 HS has the same best quality 1080p24 movie quality as the SX230 HS. Movies are encoded using the H.264 codec and saved in a QuickTime wrapper as .mov files. There’s also an iFrame option that produces files in Apple’s easily edited iFrame format as well as a Super slow motion mode that shoots at 120 fps VGA and 240 fps QVGA for playback at one quarter and one eighth real time respectively. Other options include 720p, VGA and QVGA, all at 30fps. The maximum recording time for HD clips is 4GB or a second short of half an hour, whichever comes first. At the 1080p24 resolution the data rate is around 38 Megabits per second which equates to about 15 minutes of footage on a 4GB card, and Canon recommends SD speed class 6 or higher cards. The SX230 HS has a dedicated movie mode button so you can record video regardless of the position of the mode dial. Some stills modes, including all of the Creative filter and many scene modes, can also be used for movie shooting. In Miniature mode the action is sped up and you can choose one of three playback speeds. There’s also a movie position on the mode dial which switches the screen to 16:9 view and sets the shooting mode to standard. Movie exposure is set automatically but you can lock it prior to shooting and adjust by up to two stops either way. The SX240 HS has built in stereo mics and an electronic wind filter. There is one new aspect to movie recording and that’s the new Powered IS image stabilisation which replaces Dynamic IS on the PowerShot SX230 IS. It’s hard to say just how much of a difference this makes as Powered IS is designed to address video wobbles at long focal lengths and the SX240 HS can zoom much further than the SX230 HS. One thing’s for certain and that is hand-held long shots are much steadier with Powered IS activated than without it. The SX240 HS copes quite well in these demanding into the light conditions. The zoom motor is quite audible in the faster of the two positions (see the tripod mounted shot for the slower quieter zoom in action). Although it can’t iron out all the wobbles Powered IS does a fair job of keeping things reasonably steady at 500mm. The zoom motor is much quieter (though not silent) at the slower of the two speeds, though it can be difficult to judge the position on the rocker. The autofocus wanders a little during the zoom, but is quick to recover. More worrying is the waviness that occurs at full zoom magnification, despite stabilisation being turned off for this tripod-mounted shot. Indoors in the low light the continuous AF works well to smoothly transition from near to middle distance subjects, but the exposure isn’t particularly responsive. The SX240 HS can also shoot video using some Creative Effects filters. Here’s Miniature mode with playback at 10x producing a six second clip from a minute’s worth of shooting. Other options are 5x and 20x. Note like other recent Canon compacts, the SX240 HS will only record VGA video if the photo aspect ratio is set to the default 4:3. In order to unlock an HD option for filming with Creative Effects, you’ll need to first set the photo aspect ratio to 16:9, at which point video will be captured at 720p. The SX240 HS takes a fraction under two seconds to start up which is pretty average and about the same as the Lumix ZS20 / TZ30. The zoom rocker has a two speed motor regardless of shooting mode: the action is reasonably quiet in the slower of the two speeds but at the faster speed becomes clearly audible on movie footage. It’s also quite tricky to position the rocker accurately for the required zoom speed – it’s all too easy to cross the line and accidentally slip into fast mode when shooting movies. The menu system is pretty easy to navigate, though the shooting settings menu is long and looking for things like image stabilisation, i-Contrast and AF settings can be tiresome. But most of the every day functions are on the Func menu which, with its two-tiered overlay, provides pretty much instant access. The AF is quick and accurate both in Face detect mode and the fall back area AF, though in Smart Auto mode it too easily interprets camera movement for subject movement and switches to AF tracking. Like the Lumix ZS20 / TZ30 the SX240 HS provides Face ID allowing the registration of up to 12 people. For those who like to be in complete control there’s also a manual focus option, but the SX240 HS lacks anything like the Lumix ZS20 / TZ30’s custom modes. The SX240 HS has a full resolution continuous shooting mode which operates at 2.2 frames per second with focus fixed from the first frame, though Canon has now reduced the previously claimed speed to match the actual speed of this feature. But the big news is the massive improvement in Hi Speed Continuous mode which can shoot a burst of 10 frames at 10.3fps also at full resolution. Canon compacts aren’t known for impressive continuous shooting performance – the best the earlier SX230 HS could manage was 6.5fps at 3M resolution. Though the SX240 HS lacks the ZS20 / TZ30’s reduced resolution burst formats it can now match (in fact slightly beat) it for full resolution continuous burst shooting and that’s a significant and welcome improvement. A blue VW van in the rain may lack the glamour of Gordon’s Shotover Jet examples, but nonetheless gives a good demonstration of the PowerShot SX240 HS’s high speed continuous shooting capablity. The PowerShot SX240 HS is equipped with a 12.1 Megapixel sensor measuring 1 / 2.33 inches, this is the same specification as the sensor in its predecessor, the SX230 HS, but the processor has been updated to the newer Digic 5. The sensitivity range is 100-3200 ISO and the shutter speed ranges from 15 seconds to 1/3200. Images are saved as JPEGs at one of two compression setting. Best quality JPEG files are on average 3-5MB in size. To see how the quality of the PowerShot SX240 HS measures-up in practice, take a look at my Canon SX240 quality and Canon SX240 noise results pages, browse my Canon SX240 sample images, or skip to the chase and head straight for my verdict.